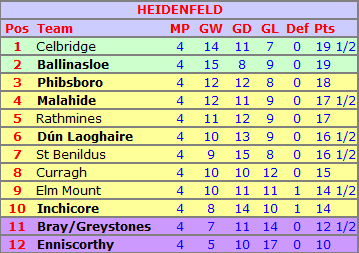 The club’s recent league games saw the Heidenfeld break their drawing streak, only for the BEA South B and the Bodley South B both to pick up their first draws of the season, with Brady v Ó Cinnéide a rather unlikely pairing in the Bodley game. On Wednesday, the Heidenfeld were in action against Elm Mount – so having started with three successive draws, we were playing a team who were on exactly 50%. We out-rated our opponents on all boards bar one – although most of their top boards were at least 100 points higher in recent years, so this was still a well-matched encounter. Dave started off with a relatively quick draw against Pat Fitzsimons, but Ciarán M won an exchange on the bottom board and converted, while Michael was two pawns up in a double-rook ending only for the game to somehow end in a valid claim of three-fold repetition from his opponent; the ending was in fairness far from trivial anyway. I had a wild game right from the off, and survived first a position of -4 to get back to level, then went back to -2, then back to level again, before going to forced mate and -8 on successive moves . 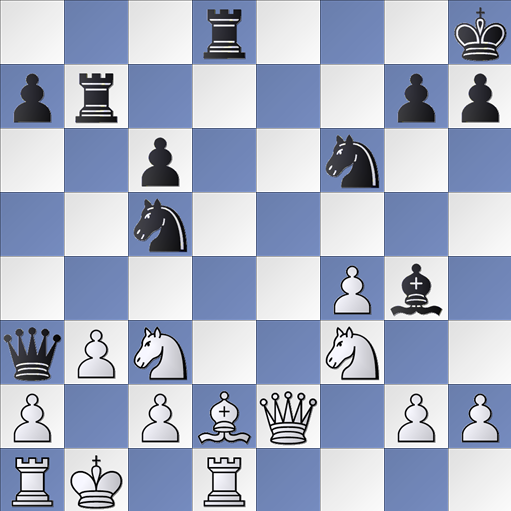 The mate is probably of interest; the position below is mate in 14. How to kick it off? 1. … NxP! 2. axN RxP! 3. PxR Bf5+ – this is the move I, and presumably my opponent, had missed. Although black is temporarily a rook and piece down, the win is trivial from here and white will have to give up his queen to block the check. Instead, the game continued 1. … Rb8 2. Bc1, and now black can again sac both rooks on b3 with devastating effect. But black missed this – I’d only been looking at the knight sac here, thinking I could block the rook sac with Bb2, again missing the power of Bf5+ – and played 2. … Qb4? ?, after which his attack is over and I’m just better. Black’s position collapsed quicker than it probably needed to after this, and I was able to take a win which brings me to a new rating high of 1723; I’m the team’s top scorer on 3½/4 and am currently myself and Stephen Brady are the only players in the entire club with a 2000+ performance in the leagues this season! Dylan drew on 2, but while Ciarán R and Brendan both lost pawns which ultimately cost them the game, an opposite-colour win from Vjeko on 3 saw us take a narrow win which leaves us nicely mid-table. It is a very tight table though – 5½ points from first to tenth – and a decent win somewhere along the line could push us back into promotion contention again. We travel to Inchicore in our last match before the Christmas. 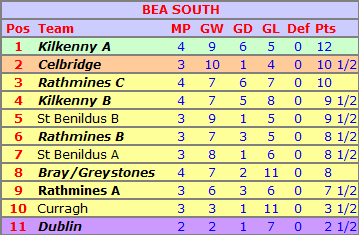 At the same time, there was one game from the Kilkenny A v St Benildus B BEA match on. Eric – second in the recent Kilkenny tournament – was up against Maurice Buckley, organiser of said tournament. Eric was in no mood for saying thanks though, and after coming through a bit of shaky opening, he was gifted a piece in the middlegame, and his opponent immediately resigned. This has gone in at number two on our High Fives, and means that Eric will finally be close to the 1200 mark when the O’Hanlon and BEA get rated. The rest of the games were on on Saturday in the library, and a couple of other excellent results were added. Yubo beat Niall Fitzgerald – 367 points higher-rated – and Lorcan held Jack Lowry to a draw on the bottom board. Various Wangs now occupy each of the top five best non-Bodley wins, and various Cooneys take up three more places, albeit that one is Lorcan’s loss to Robbie in the opening-day A v B match! But Lorcan has gone straight to the top of the Best Draws, knocking a Wang and a Cooney down to spots 2 and 3. Thomas and Zhengjun lost on the top boards – needless to say, this is a particularly strong Kilkenny team who are one of the favourites for promotion – but a match draw was an excellent result. 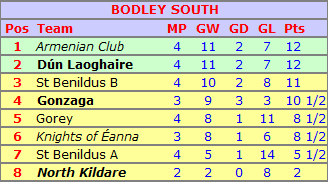 A trip to struggling Bray is next up; Eric is top scorer on 3/3. The Bodley B were hosting Gorey at the same time, hoping for a big win as the As had beaten Gorey 4-1 but had lost 4½-½ to the Bs. It didn’t quite go that way though, in part because Gorey had added a 1300 to their team on board 2. We started well though; Taylor got his second win in a row on board 5, before Ryan scammed a draw when his opponent stalemated him when completely winning – with Karel sitting this one out, it means Ryan is now the team’s top scorer on 2½/3. Board 1 ended in a curious scoreline – Brady 0-1 Ó Cinnéide. That’s Stephen’s son up against Mel’s nephew, in case it wasn’t clear! Carl had winning chances against the 1300 on board 1 but ultimately went down to defeat, while Venkat won on 3 to secure a draw at least. A win would have made things interesting at the top – we’d have joined two other sides on 12 points – but for now, it’s a solid start to the season. There’s two months until the next match, at home to Dún Laoghaire; the As host Gonzaga next week.